The military use of motion pictures during World War I was mostly restricted to two purposes: instructing soldiers and historical documentation. Films were also used for publicity purposes but the military command did not give this idea much thought. This situation was the same in all belligerent countries, including the United States. An interesting example how films were used by the U.S. Army for military training comes from U.S. Signal Corps footage that was uploaded by the National Archives in January 2015 on the Internet. The footage was edited into the "Historical Series" which was compliled by the U.S. Signal Corps in 1936. This World War I film shows in detail the nomenclature, assembly and disassembly, and operation of a Lewis machine gun. Reel 2 shows infantry troops at Camp Meade, Maryland, lined up in various battle formations. The first reel is particularly interesting because it shows how the U.S. Signal Corps used new camera techniques such as 'stop motion capture' to demonstrate the use of the Lewis machine gun. The military training film by the U.S. Signal Corps can be watched here. When the United States entered World War I in 1917 films became an important tool for official propaganda purposes. The organization behind these operations was the Commitee on Public Information (CPI) or the "Creel Commitee". Named after its chairman journalist George E. Creel, the CPI launched a massive publicity campaign to get America behind the Great War. "The World's Greatest Adventure in Advertising"
Creel was a firm believer in the power of the media and he called his publicity campaign "The World's Greatest Adventure in Advertising". Although films were a relatively new medium at the time the CPI did not neglect the movies. America's participation in the Great War was widely shown on screen. 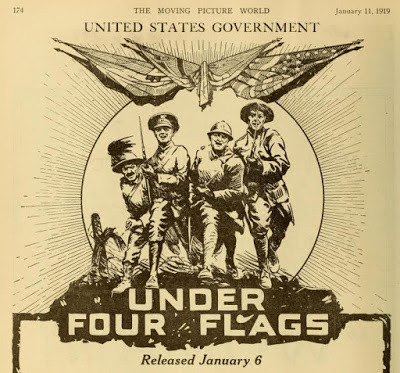 Using official footage shot by military cameramen of the U.S. Signal Corps the CPI produced three feature documentary films, as well as numerous shorts and a newsreel, The Official War Review. Film stars such as Charlie Chaplin and Douglas Fairbanks were also mobilized by the CPI to urge people to buy War Bonds and enlist for the American Army. More information on Creel's film program can be read in a chapter of our book American Cinematographers in the Great War. Here is a short clip uploaded to our YouTube channel on these films by the Commitee on Public Information. 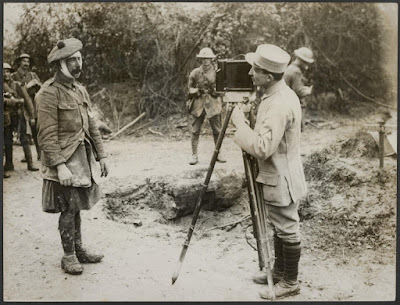 For his photographic work during World War I American cameraman Ariel Varges (1890-1972) was appointed an honorary member of the Most Excellent Order of the British Empire. We recently found the official letter signed by King George V in Varges' personal collection which was put up for sale on the Internet. Ariel Varges (1918). On the frontside Varges wrote "Sincerely yours, Ariel Varges, New York American staff"
Varges featured before in this weblog. He ranked among the most prominent, pioneering film cameramen of World War I. As described in our book on the American cinematographers of the Great War, Varges worked for William Randolph Hearst and he came to Europe in December 1914. By using his close contacts with Sir Thomas Lipton, Varges got on a ship for the Serbian front and filmed the war in the Balkans. 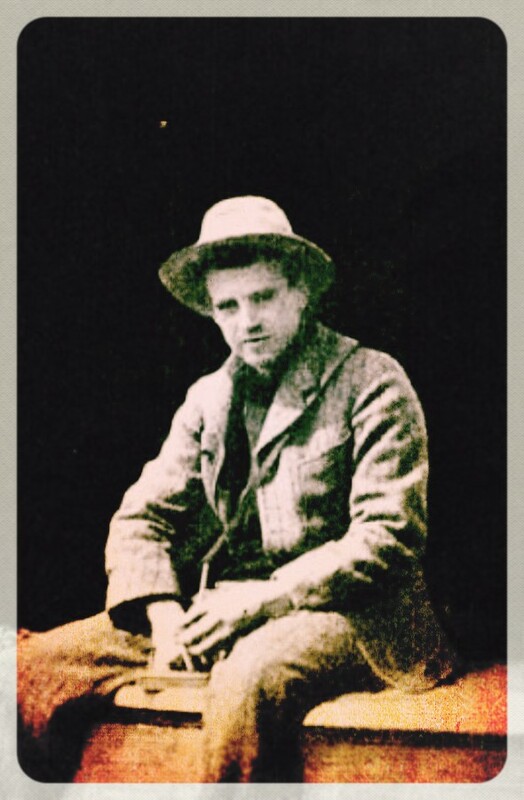 From 1916, Varges became an official cinematographer for the British Army and filmed in Greece and Mesopotamia. The letter by King George is dated November 4, 1919. Varges apparently received this honorary appointment when he was in Paris one year later, because there is an accompanying letter dated June 26, 1920 in his personal collection, which was signed by the British Ambassador in France. The collection also has a signed photograph of Varges. The backside of this picture is dated October 1, 1918. On the frontside of the picture one of the newspapers he worked for is mentioned, the New York American. The Most Excellent Order of the British Empire was established by King George V in June 1917 for services to the British Empire, rewarding contributions to the arts and sciences, work with charitable and welfare organisations and public service outside the Civil Service. In December 1918 the Order was split into two divisions: a Civil Division for civilian recipients and a Military Division to the Order for awards to be conferred on commissioned officers and warrant officers for distinguished service in action. Because of his photographic work during World War I Varges was awarded with a Military Division Order of the British Empire. His personal collection can be seen on this website of an online auction. Among the American journalists reporting on World War I Robert S. Dunn deserves a special note of interest. Born in Newport, Rhode Island, in 1877, Dunn was an explorer and naval officer whose interests carried him into many corners of the world. After his graduation from Harvard in 1898, he travelled the Yukon Trail to the Klondike and became a journalist upon his return. In 1908 Dunn led the first climbing party that reached the top of Mt. Wrangell, Alaska. As a war correspondent he covered the Russo-Japanese War, the attack by the US Marines on Veracruz and General Pershing's expedition into Mexico against Pancho Villa. During World War I he was a correspondent for the New York Post. Dunn described his war experiences in his book Five Fronts - On the Firing Lines with English, French, Austrian, German and Russian Troops (1915). As mentioned in a previous weblog, the German government in January 1915 produced a film on the living conditions in occupied Belgium. American cameraman Albert K. Dawson and Austrian newsreel photographer Hans Theyer were assigned to accompany Dunn and a group of fellow American reporters, including Jack Reed, to make an official film. 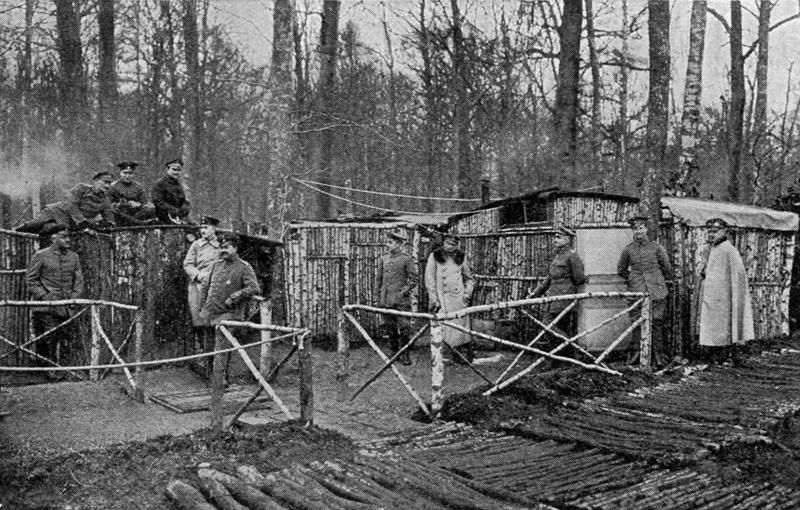 The film project was set up to show the world that the Belgian people were treated decently, thus trying to disprove the stories on atrocities committed by German soldiers in Belgium. Scenes from this movie were found by the authors while researching our book American Cinematographers in the Great War. You can read more on this historic film in our latest book. Comines lies just across the old French frontier, in Belgium. We had luncheon with our generous corps' staff, in some residence all dark with ambrequins and terra cotta plaques. It was the usual officers' mess - the long table lined with mystifying uniforms, bantering one another but carefully gracious to you; boiled meats to eat, yet more of the wine of the country than beer. And that our hosts were all-Bavarian was plain from the captain on my right, who had been to Oxford, and was willing enough to admit in argument the social and economic dangers of a military hierarchy. Consider that, from a hide-bound German soldier, on the edge of battle! Three o'clock found us threading the narrow streets of Houthem, the divisional headquarters, and a stage nearer the inferno of the trenches. Already any windows left in the village were rattling to the detonations of shrapnel; their sudden spawning white plumes over the long rise west of the town made the woods on its crest seem alive. The place itself was shelled nearly every afternoon. A few more house size holes in its walls and roof, and the brick church de l'Assomption would be no more. We climbed the belfry, but only to see a shattered Norman church, with a rooster weathervane and a wrecked village rise from the crest of woods. Between and beyond these, the German cross-fire over the invisible French trenches yonder appeared to meet, in white spurts like two streams of cloud sped from separate air currents and waxing furious, brought out a hundering answer from the French batteries further north. On the ground again by the divisional station, two soldiers came down the road from that quarter carrying an elegant new coffin on their shoulders. And behind them tooted the motor-car that had taken our official cinema men [Dawson and Theyer] to the artillery up there. Exactly what had happened, the counter insinuations in the pair's stories only fogged. A shrapnel shell — or a grenade — had exploded in the air or hit the ground ten up to a hundred yards away. Somebody had dropped his [movie] machine and run, but some one else had skipped out first, while No. 2 had fled only because No. 1 wouldn't stand his ground while he had shouted to him, thought he had, et cetera. One boasted of a splash of mud hurled against his back, which was quite clean, both where he could and couldn't see it. They agreed only in their breathless resolve to hustle back to Comines, with the twenty feet of film that the first peep of sun in a week had vouchsafed them. In 1918 Dunn was commissioned an officer in the U.S. Navy, and served as an intelligence officer in London and in Constantinople. During his later years, he concentrated on horticulture and on writing in his home in Katonah, New York. 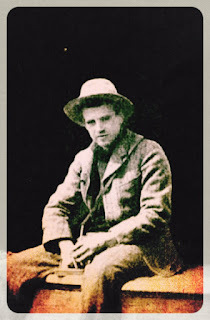 He wrote two published novels, Youngest World and Horizon Fever and one book of verse. Dunn's autobiography was published in 1956 after his death. Robert Dunn's book On Five Fronts (1915) can be read and downloaded here.